Zumbo tops The Block, Survivor. Seven’s unrelenting promos for Zumbo’s Just Desserts have paid off with the show winning its timeslot on 1.08m viewers. It topped other reality shows The Block (961,000) and Australian Survivor (734,000). Just Desserts also topped all three Demos, with Have You Been Paying Attention, The Block and Survivor fighting for remaining places. Australian Survivor alas was fourth in its slot, behind ABC’s 7:30 and losing 50,000 viewers from its premiere. Elsewhere yesterday Seven News and A Current Affair were timeslot winners. The Live broadcast of the Olympics Closing Ceremony drew 614,000 viewers. Seven News was #1 with 1.28m / 1.25m viewers for Seven followed by the premiere of Zumbo’s Just Desserts (1.08m), Home and Away (878,000), The Chase (719,000 / 461,000), and Australia’s Cheapest Weddings (708,000). Closing Ceremony highlights averaged 262,000. Nine News (1.08m / 1.02m) was best for Nine followed by A Current Affair and The Block (both on 961,000). Hot Seat was 605,000, Movie: Casino Royale was 430,000 and Footy Classified was just 62,000 in 3 cities. Have You Been Paying Attention? led for TEN with 843,000. The Project drew 767,000 / 518,000. Australian Survivor was 734,000. TEN Eyewitness News was 556,000 and NCIS: New Orleans was 296,000. 7:30 (846,000) was best for ABC followed by Australian Story (839,000), ABC News (805,000), Four Corners (647,000), Media Watch (640,000) and Q&A (532,000). On SBS it was After the Wave (203,000), Defeating the Hackers (191,000) and SBS World News (187,000). ABC2’s Teacup Travels was best on multichannels with 264,000. Agree with many of the comments about Zumbo. What a train wreck… part Great British Bake Off, part Masterchef without any of the heart, joy or fun of either. We made it through 5 minutes of Zumbo, we put on last nights’ tonight. Deleted it, tonights’ recording and tomorrow nights’ scheduled recording. Its the kind of set and music that may have made Spelling Bee more appealing to kids while the narrator sounded like something out of one of those British docos that you leave on to get to sleep to. Good Lord!-that cheap weddings thing on 7 nearly matched 10’s Survivor!-people here who are rabid fans of S seem to have forgotten that its been many years since the US version was widely popular in Oz (which is why it airs on secondary 9 channels now)-can’t see how anyone would expect it to grow in viewership from now-and it too was incessantly promoted by 10 over the last several months. 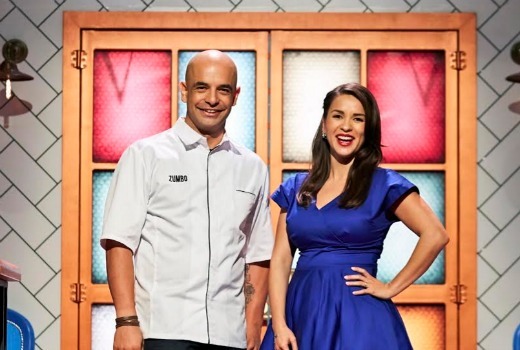 I like Adriano Zumbo and Rachel Khoo…but in their other vehicles…Master Chef and Rachel’s own shows….I did not watch this…was exhausted from all the ads during the Olympics…. I watched the Olympics Closing Ceremony and the best bits collage afterwards…and both were really enjoyable….I did not watch the opening ceremony so cannot compare …. I will watch Australian story…4 Corners and Q&A on Iview….